PERSON OF INTEREST comes back for its 8th episode in its third season and we can’t wait to see what happens tonight on the new episode entitled “Endgame.” On tonight’s show a window into Carter’s past is seen through flashbacks with her son’s father. Did you watch last week’s episode? We did and we recapped it right here for you! On last week’s episode the number cames up of a hypnotherapist whose life, upon investigation by the POI team, suggests he is more than just a master of the mind. Meanwhile, Carter tracked an antiquities dealer whose business was connected to the crime organization HR. On tonight’s show the POI team’s war with HR nears a boiling point when Finch receives 38 numbers at once from The Machine. He discovers they are connected to an unknown player who is inciting an all-out war between the crime organization and the Russian mob. Meanwhile, a window into Carter’s past is seen through flashbacks with her son’s father. Tonight’s Person of Interest Season 3 Episode 8 is going to be exciting, and you won’t want to miss it. 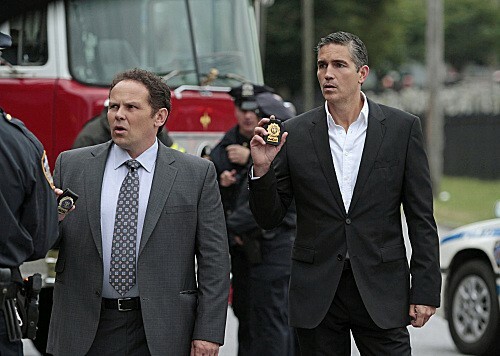 So be sure to tune in for our live coverage of the new episode of Person of Interest — tonight at 9PM EST! While you wait for our recap, hit the comments and let us know how excited you are about the show. Don’t forget to come back at 9PM for our LIVE recap! The machine is issuing a stream of new numbers and it’s not all that surprising when the numbers are all revealed to be cops from HR. Reece goes with Fusco to see why HR would be going through an inner conflict. What they found is that HR dropped the ball. They were supposed to protect a shipment belong to the Russian mafia. But no one showed. That may have something to do with Carter. Her partner Lansky was to be out the night he died doing some sort of patrol. Her interference got him killed along with his HR partner. Yet for now she’s playing it cool. She sends out feelers to HR. She wants them to think she’s quitting on the whole takedown. As they begin to believe she’s no longer a danger, she’s going all in. Carter sent away her son and she’s cutting ties with Reece. She doesn’t need anyone to stall or stay her hand. She’s going rogue. She even went as far to destroy her phone. But she can’t fool her old partner. Fusco knows she staged the scene. He wants to warn her to be safe and yet is quick to realize she won’t confide in him. Not with the way she is. The great alliance between HR and the mafia is slowly breaking down. After the missed shipment, the mafia wants to do things without them. They’ll begin to run their own security. And surprisingly they don’t run into any problems but they do make an ally. Carter called in Elias to lay the groundwork. The alliance is crumbling but a nice good push could bring it all down. Setting up doubt is the perfect place to start. Not so long after Elias warned them HR will betray them, a shipment goes missing. It wasn’t HR though. Carter hijacked a shipment. Reece and Finch saw the footage of the whole thing and thought it was Shaw. Once she set them straight however they become even more worried. Carter isn’t doing thing by the book anymore and Reece is worried her number will come up soon. Cal’s godfather’s number came up. Finch and Reece know he’s the head of HR. Quinn as the chief of staff to the mayor was in the perfect position to keep the organized crime empire running. The team knows this situation deteriorated in a personal cause for Carter. Still they don’t know how far she’s willing to go. Carter shot at Quinn. As retaliation for the attack he believes comes from the Russians, Quinn moves his cops into mass arrests mode. They round up everyone except the boss. Which turns out to be a good thing. Carter offers him her help. If she arrests him he’ll be safe for a while at least. She did that in order to learn about Cal’s death. She wants the great Peter Yogorov to turn informant. In exchange she’ll make sure his brother is safe. He agrees albeit reluctantly. Leaving Fusco in charge of taking over (in case happens to her), she goes alone to finish everything. Fusco tried to tag along but she tricked him at the last minute. But has she bitten more than she can chew. HR is more than dirty cops. There are dirty politicians and dirty judges. Can she honestly take all of them down alone? Carter seems to have her own doubts. She called her son and in her own way said goodbye. She makes it to the judge’s place. She finds HR waiting for and is glad to know she brought along friends. Reece helps her get Quinn. They quickly make their escape but Reece was spotted on camera. HR has a picture of him to circulate now. He’s isn’t the mysterious stranger in a suit anymore.